Now some of our most popular customizing services are only a click away! You know how easy it is to request different skirt styles, sleeve styles, and accent colors....now it is even easier! Just start your order with any of our ice skating dresses, figure skating dresses or skatewear from one of our collections, then add an Alterific choice to your order. It is just that simple. Yes! Fabric samples are free!Revella Skatewear offers you more choices, and more ways to get your competition ice skating dresses, testing ice skating dresses, and practice ice skating dresses your way! Items on this page are not sold separately. Be sure to check out page 2 for more great possibilities! Custom Fit purchase to be added to my order. Add a custom fit to your order. Do you prefer a flat ice skating skirt? Click here to replace the skirt on your ice skating dress order with a spandex, flat skating skirt! Want a more delicate look for your flat ice skating skirt? Choose this two-layer mesh flat skating skirt. ALT502 - 2-layer skirt with spandex lower layer and mesh top layer. Add this 2-layer spandex and mesh skirt to your ice skating dress order. Add this ice skating skirt to your ice skating dress order. Full skating skirt flows while you skate. Click here to have this fabulous skating skirt added to your ice skating dress order! Full skirt flows and moves as you skate and spin! Add this flowing, two-layer mesh skirt to your ice skating dress or figure skating dress order for that ‘wave’ look as you spin! Need a flowing skirt to add grace and beauty to your ice skating dress order? Click here to add this two-layer mesh skirt to your shopping cart. Need a beautiful, flowing skirt for an elegant ice skating dress? Click here to add this two-layer mesh to your dress order. Get this delightful angle-style skirt on your ice skating dress order! Skating skirt has top layer in spandex and lower layer in mesh. Need an ice skating dress for dance? Add this item to your dress order, and get this knee length flowing dance skirt added to your dress order! Beautiful mesh two-layer skirt flows as you skate. Get this asymmetrical ice skating skirt with your dress order. Handkerchief skirt has longer points for a more dramatic look to the hemline. Click here to add this elegant ice skating skirt to your ice skating dress order. click here to add this fabulously layered skirt to your ice skating dress order. Add this fun, flowy skirt to your ice skating dress order. Get this pointed hemline skirt on your ice skating dress order! Get this angle skirt on your ice skating dress order! ALT521 mesh skirt with a touch of fullness. Get this popular mesh on your ice skating dress order! ALT522 spandex skirt with a touch of fullness. Get this popular spandex skirt on your ice skating dress order! ALT523 spandex skirt with wrap and pointed hem. Get this beautiful spandex skirt on your ice skating dress order! Click here to add long velvet sleeves with fingerpoints to your ice skating dress order! Click here to add long sleeves with accent colored fingerpoints to your ice skating dress order! 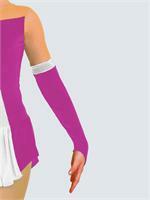 Click here to add long spandex sleeves with fingerpoints to your ice skating dress order! Long sleeves with gloves add a classy touch to your ice skating dress! Click here to add skin-tone long sleeves with fingerpoints to your ice skating dress order! Add long mesh sleeves with fingerpoints to your ice skating dresses! Alterific items replace existing parts of the ice skating dresses you are ordering. In some cases, Alterific items are an addition to your ice skating dress order - such as adding sleeves to sleeveless ice skating dresses. You have the choice of selecting matching colors or contrasting colors for your ice skating dresses. Ice skating dresses, figure skating dresses, and skatewear purchased with Alterific alterations cannot be returned for refund or exchange. Please be sure of your size and color choices. Some Alterific items are only available on certain skate dress styles; please review your selections when ordering. If you choose incompatable ice skating dress items, we will contact you. If you need alterations not shown on this page, please contact us for availability and pricing or try our Design Center. Fabric colors shown in the images are for example only. Be sure to select the colors and fabrics you need for skate dress your order! If you need assistance, feel free to contact us. Learn more about our various services.